Robert M. Horkovich - Insurance Recovery Attorney | Anderson Kill P.C. ” by Law360 in 2012 and 2018 and was named Lexis/Nexis “Policyholder Lawyer of the Year” in 2009. He is rated “AV® Preeminent™ Peer Review Rated” with a 5.0 out of 5.0 rating in Martindale Hubbell. 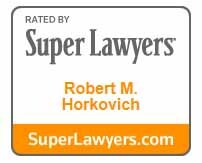 Mr. Horkovich has been selected by his peers for inclusion in Best Lawyers for insurance law in every year since 2009 and Super Lawyers for Insurance Coverage since 2006. He has been selected as a Fellow of the American Bar Foundation, the premier institute for social science research regarding law in the USA, an honor limited to one-third of one percent of the lawyers in America. Rated “AV® Preeminent™ Peer Review Rated” with a 5.0 out of 5.0 rating in Martindale Hubbell. Chambers USA leading insurance recovery attorney since 2005. Super Lawyers for Insurance Coverage since 2006. The Legal 500 US for Insurance: Advice to Policyholders since 2006. The Best Lawyers in America for insurance law since 2009. Lexis/Nexis “Policyholder Lawyer of the Year” in 2009. Recognized as an Insurance MVP by Law360 in 2012 and 2018. Selected as a Fellow of the American Bar Foundation (limited to 1/3 of top 1% of U.S. Attorneys), New York, Maryland American Bar Associations, Member, Sections on: Litigation; Tort and Insurance Practice. Captain, USAF JAG Corp.; 1100 ABW/JA (1980 - 1982) and USAF/JAJM (1982 - 1984), drafted all trial briefs in the 1981 prosecution of 1st Lieutenant Christopher Cooke, an espionage case subject to national media attention defended by F. Lee Bailey; Awarded Meritorious Service Medal and Air Force Commendation Medal. Named Outstanding Company Grade Officer of the Year, Bolling Air Force Base, Washington, D.C.
State of California v. Continental Insurance Co., et al., No. 239784 (August 11, 2015). Court award of $13,914,082.09, the full amount of mandatory prejudgment interest owed by the two CNA insurance companies, after bench trial. CNA previously agreed to pay $12 million, its full limits, before the prejudgment interest trial. State of California v. Underwriters at Lloyds, et al., No. 239784 (May 16, 2005). Jury verdict in favor of coverage for the State of California's clean-up of the Stringfellow Acid Pits, described by a federal court as the most complex environmental clean-up in the world. Jury found all five (5) remaining insurance companies breached their contracts and rejected every coverage defense. To date we have recovered $172 million in indemnity plus $60 million in defense costs and $14 million in pre-judgment interest. Fuller-Austin Insulation Co. v. Fireman’s Fund Insurance Co., et al., No. BC116835 (Los Angeles Superior Court) (May 5, 2003). Jury verdict of $188,793,014 in favor of policyholder against Lloyd’s, Stonewall Insurance Company and Highlands Insurance Company in an asbestos insurance coverage case (a top 10 jury verdict in the U.S. in 2003). Affirmed in part and reversed in part on appeal. Two previous bench trials. Gross settlements of over $190 million from 14 different insurance companies achieved before trial. Over $50 million in settlements achieved after trial. Wausau v. Tektronix, CCV 9908032 (Clackamas County, Oregon). (June - August 2002). Jury verdict and declaratory judgment in favor of coverage at six environmental sites despite Wausau’s claim that alleged 15 year late notice was worst in Wausau's history; also won attorneys' fees. Bench trial regarding coverage for RCRA - rather than CERCLA - clean-up. Waste Management, Inc. v. Admiral Insurance Co., et al., Docket No. HUD-L-931-92. (New Jersey Superior Court, Hudson County). (October 2001 - January 2002). Won trial of insurance coverage for environmental liability at five New Jersey sites. All but a few insurance companies settled before or during trial. Pereira, Trustee of Payroll Express v. Marshall & Sterling, Inc., No. 92-B-43150 (CB)/98-8405A. (U.S. Bankruptcy Court, Southern District of New York). (January - May 2002). 2005 WL 2438444. Tried and won an insurance broker malpractice action resulting in a judgment in excess of $21.8 million in bankruptcy court. District Court reversed - case was settled. Weyerhaeuser Co. v. Commercial Union Ins. Co., No. 92-2-05214-8 SEA. (March 2002). Bench trial resulting in decision in favor of coverage at Commencement Bay; also won attorneys' fees. ZRZ Realty Company, et al. v. Beneficial Fire & Casualty Company, et al., Circuit Court No. 9708-06226. (Oregon Superior Court, Multnomah County). (October - December 1999). Won trial establishing defense obligation and declaratory judgment to pay future environmental clean-up costs; also won attorneys' fees. All but Lloyd's settled before or during trial. Bijan Designer for Men, Inc. v. Fireman’s Fund Insurance Co., No. 603814/97. (New York Supreme Court, New York County). (December 1999). $9 million jury verdict in favor of policyholder on insurance claim arising out of the St. Regis Hotel fire. Cascade Corp. v. American Home Assur. Co., et al., No. 9205-03083. (Oregon Superior Court, Multnomah County). (July - October 1998). Won trial establishing Lloyd's missing policies, jury declared $11 million in environmental clean-up costs covered; declaratory judgment to pay certain future environmental clean-up costs; also won attorneys' fees. All but Lloyd's and Employers Re settled before trial. Affirmed by Court of Appeals on appeal. Weyerhaeuser Co. v. Aetna Cas. & Sur. Co., et al., No. 92-2-05214-8 (MJP) (Civil Track I). (Washington Superior Court, King County). (June 1997). Commercial Union offered $4 million judgment against itself the day before a 10 environmental site trial. McLean v. Continental Casualty Co., 95 Civ. 10415 (HB). (U.S. District Court, Southern District of New York). (1997). Won jury verdict and judgment for full policy limits in travel accident life insurance case; also won attorneys' fees. Weyerhaeuser Co. v. Aetna Cas. & Sur. Co., et al., No. 92-2-05214-8 (MJP) (Civil Track I). (Washington Superior Court, King County). (April 1996). Jury recognized coverage for five of seven Washington environmental sites; also won attorneys' fees. Weyerhaeuser Co. v. Aetna Cas. & Sur. Co., et al., No. 92-2-05214-8 (MJP) (Civil Track I). (Washington Superior Court, King County). (October 1994). Jury found coverage for Mid-State Superfund site; also won attorneys' fees. 33 out of 34 insurance companies settled before trial. Matter of Viking Pump, Inc., 27 N.Y.S.3d 244 (2016). Policyholders are entitled to "all sums", not just pro-rata share, from policies with prior insurance or non-cumulation clauses. Policyholders can spike vertically to access excess policies instead of relying on a "rising bath tub” allocation if their policies state underlying limits. Amicus brief submitted on behalf of United Policyholders, WRG Asbestos PI Trust, Asarco Asbestos Personal Injury Trust, and others, accepted by New York Court of Appeals. American Home Assur. Co. v. Port Authority of N.Y. & N.J., 123 A.D.3d 633, 1 N.Y.S.3d 29 (1st Dept 2014). Policyholder entitled to attorneys' fees in establishing duty to defend even when policyholder moves for summary judgment on its counter-claim for defense. Cleaver-Brooks, Inc. v. AIU Ins. Co., 351 Wis.2d 643, 839 N.W.2d 882 (2013), rev. denied, (2014). Established that excess insurance companies sharing a layer of coverage can be ordered to pay the policyholder simultaneously and not sequentially. State of California v. Continental Ins. Co., 55 Cal.4th 186, 281 P.3d 1000 (2012). Won landmark decision from California Supreme Court establishing that policyholders are entitled to the entire limits (all sums) of their insurance policies instead of some reduced pro-rata share and that policyholders are entitled to the benefits of policies for all years (stack), not just a single year, in which the loss occurred. State of California v. Allstate Ins. Co., 45 Cal.4th 1008, 201 P.3d 1147 (2009). Won landmark decision from California Supreme Court establishing that policyholders are entitled to coverage for whole loss when there are both covered and uncovered causes unless the insurance company can bear its burden to prove the exact amount of the loss attributed to the uncovered cause. Also won decision that the polluter's exclusion applied to the discharge from, and not into, the contaminant facility, which significantly narrowed the application of the polluter's exclusion. Cascade Corp. v. American Home, et al., 206 Or. App. 1, 135 P.3d 450, (Or. Ct. App. 2006) app. dismissed, 2007 Ore. LEXIS 1110 (Or. 2007) (excess insurance companies are jointly & severally liable under all sums policy language, no proration to policyholder, and no off-sets for settlements or "other insurance" clauses). Chickasha Cotton Oil Co. v. Houston General Ins. Co., et al., 2002 Tex. App. LEXIS 5692, 2002 WL 1792467 (Tex. App. – Dallas) (2002) (pollution exclusion does not apply to coverage for personal injury, alleged misconduct by insurance companies gives rise to bad-faith and unfair settlement practice claims, the terms of missing policies may be proven by secondary evidence and mandatory insurance forms filed with state insurance departments or specimen policies from the insurance company). Weyerhaeuser Co. v. Commercial Union Ins. Co., 142 Wn.2d 654, 15 P.3d 115 (2000) (argued and briefed winning case recognizing (1) no general aggregate limit in standard form policies for claims other than products claims, (2) non-settling insurance company bears burden of showing that the policyholder was made whole, and (3) policyholder entitled to coverage even though policyholder had no relation to property during policy period). Textron Inc. v. Aetna Cas. & Sur. Co., 754 A.2d 742 (RI 2000) (briefed winning case recognizing that the word "sudden" in the polluter's exclusion can mean unexpected and that policyholders' good faith effort to contain toxic waste is covered). Textron Inc. v. Aetna Cas. & Sur. Co., 723 A.2d 1138 (RI 1999) (briefed winning case regarding trigger of coverage). American Nat. Fire Ins. Co. v. B & L Trucking & Const. Co., 134 Wn.2d 413, 951 P.2d 250 (1998) (amicus curiae) (briefed winning case). Thiokol Corp. v. Certain Underwriters at Lloyd’s, London, 1997 U.S. Dist. LEXIS 8264, 1997 WL 33798359, No. 96-CV-028-B (D. Utah May 6, 1997) (briefed winning federal district court case mandating trial despite arbitration clause) (also prevailed procedurally at 10th Circuit). Olds-Olympic, Inc. v. Commercial Union Ins. Co., 129 Wn.2d 464, 918 P.2d 923 (1996) (amicus curiae) (briefed winning case). Continental Cas. Co. v. Diversified Indus. and AT&T Nassau Metals Corp., 884 F.Supp. 937 (E.D. Pa. 1995) (argued and briefed winning federal district court case setting out right to assign an insurance claim). Weyerhaeuser Co. v. Aetna Cas. & Sur. Co., 123 Wn.2d 891, 874 P.2d 142 (1994) (argued and briefed winning case recognizing that liability policies cover environmental liabilities even when policyholder performed environmental clean-up cooperatively without suit). City of Edgerton v. General Cas. Co., 184 Wis.2d 750, 517 N.W.2d 463, 48 A.L.R. 5th 803 (1994) and 172 Wis.2d 518, 493 N.W.2d 768 (Ct. App. 1992) (amicus curiae Wisconsin Public Intervenor, Wisconsin Environmental Decade) (briefed winning case). People v. Peck, 68 N.Y.2d 928, 502 N.E.2d 991, 510 N.Y.S.2d 76 (1986) (argued and briefed winning case including constitutional issue of first impression for New York). Identified as an expert witness by NRG Energy and Louisiana Generating LLC regarding pollution liability insurance policy dispute in Louisiana Generating, et al. v. Illinois Union Insurance Company, No. 3:10-cv-00516 (M.D. La.). Identified as an expert witness by Chubb regarding bad faith claims handling practices of AIG/Chartis in Federal Insurance Company v. Cherokee Ardell, L.L.C., International Risk Group, L.L.C., and American International Specialty Lines Insurance Company (D.N.J.). Opinion solicited in a case presented to the Korean Supreme Court in Oriental Fire & Marine Ins. Co., Ltd. v. Daehan Fire & Marine Ins. Co., Ltd. regarding fidelity bond coverage under US insurance forms. Recognized as an expert by the Court and by CNA in APA-The Engineered Wood Association v. CNA, No. 96-2-08391-2 (Pierce County, Washington) (Court credited my expert testimony in awarding policyholder full recovery plus attorneys' fees). Identified as an expert regarding insurance company practices in Browning-Ferris Industries, Inc., et al. v. Certain Industries at Lloyd's London, et al., No. 98-56362-A (80th Judicial Dist., Harris County, Texas). Participated in the drafting of the environmental insurance coverage regulations for the State of Washington, Washington Administrative Code 284-30-920. This was the first set of insurance regulations adopted in the country specifically dealing with the handling of environmental claims. Interviewed on PBS "All Things Considered," July 1995. So You Think You Have A Bad Faith Case?